Happy February! Today I’m re-posting the Valentines I shared at Clever Charlotte last year. 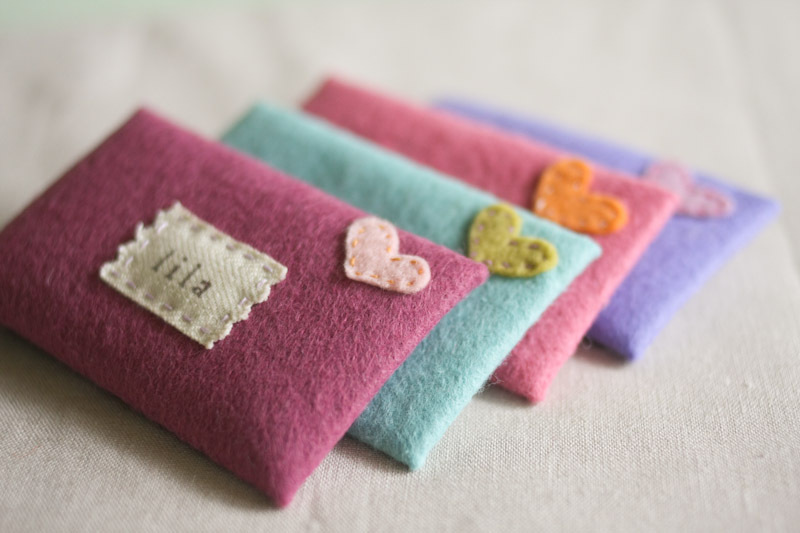 If you’d like to learn how to make some mini felt Valentine envelopes, read on…. I’m Gail from probably actually, and I’m happy to be here to share a wool creation for the Winter Wolle series! 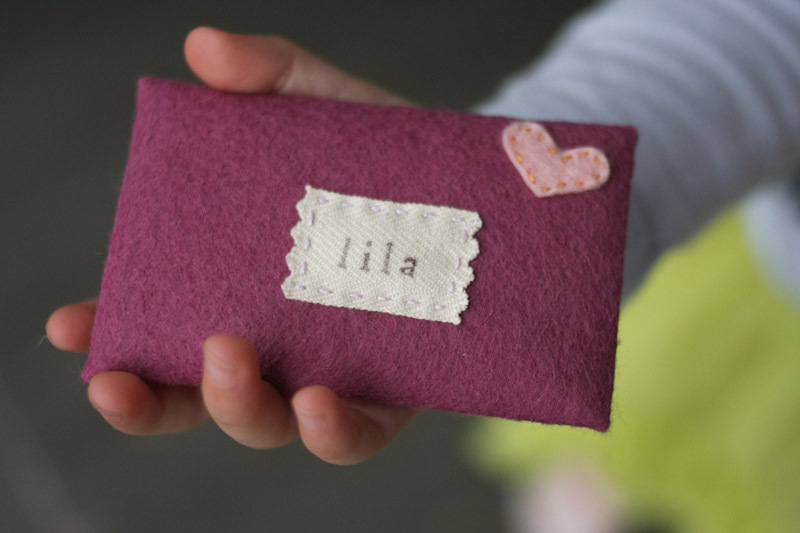 I love to make things for my daughter, and a few of my favorite past projects have been made from wool or wool felt. There’s something so satisfying about working with wool, and I especially love felt – it has such a nice texture, and cutting and sewing with it is always such a pleasure. 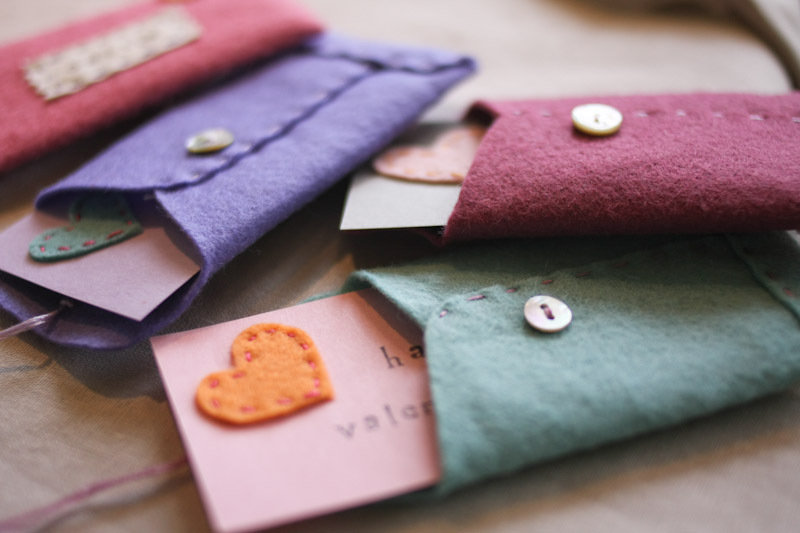 For me, felt and Valentines go hand in hand (I cut out loads of felt hearts for a garland last year), so I made tiny felt Valentine envelopes to house some mini Valentines. My mom and sisters and I have a tradition of exchanging valentines, so these are for them (and one for Lila, of course). The envelopes were cut using a Paper Source “baby” envelope template – the finished size is 2 1/8 by 3 1/2 inches (the size of a business card). 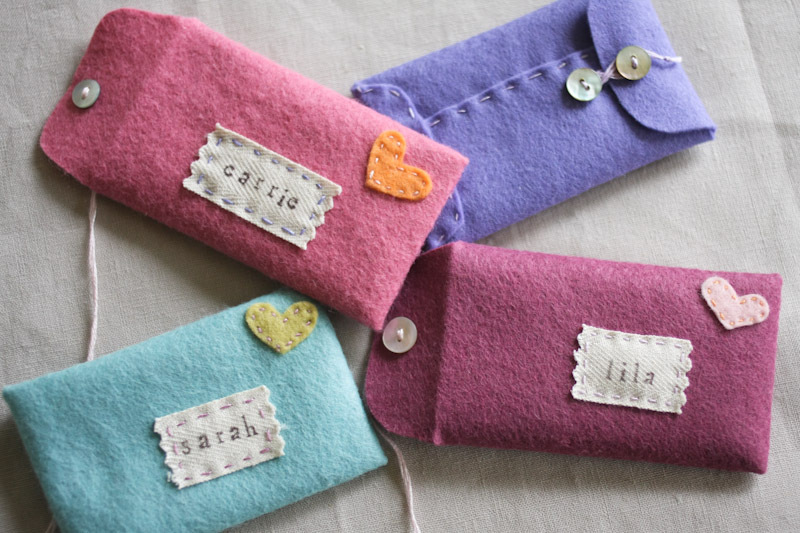 Before sewing them together I added a little felt heart in the stamp corner and an “address label” that I rubber stamped on twill tape. If you crease the envelope flaps with a hot iron it leaves you with a nice rectangle on the front, making it easy to get these additions in the right place before the whole thing is assembled. I secured everything with a running stitch using embroidery floss. Whenever I can get away with it I sew stuff by machine, but working with felt is the one time I actually prefer hand-stitching, and the embroidery floss can add a nice pop of color. The envelopes close with two little buttons. After sewing the button to the top flap, I pulled the thread (I used embroidery floss here, too) to the inside and left it about six inches long – that remaining length of thread is used to secure the envelope shut with the bottom button, manila envelope style. 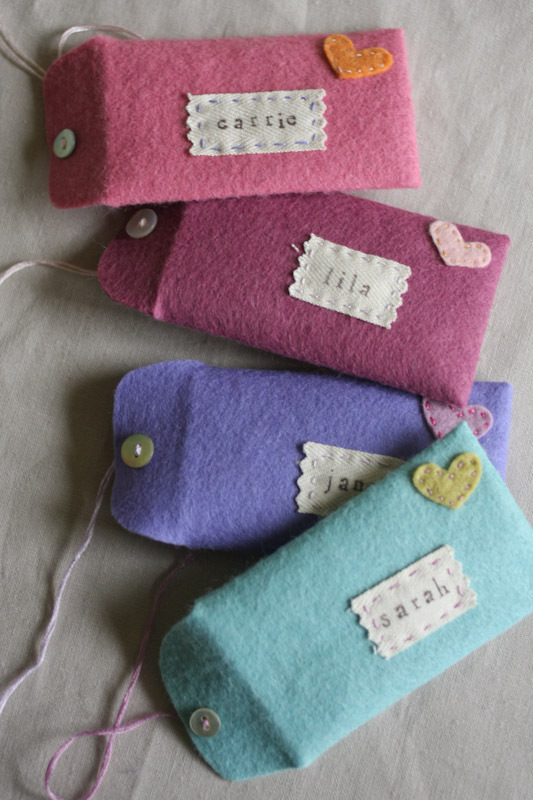 Tucked inside are little Valentines – just a felt heart stitched on by hand and a stamped message. There you have it. Thanks so much for having me, and happy Valentine’s Day everyone! 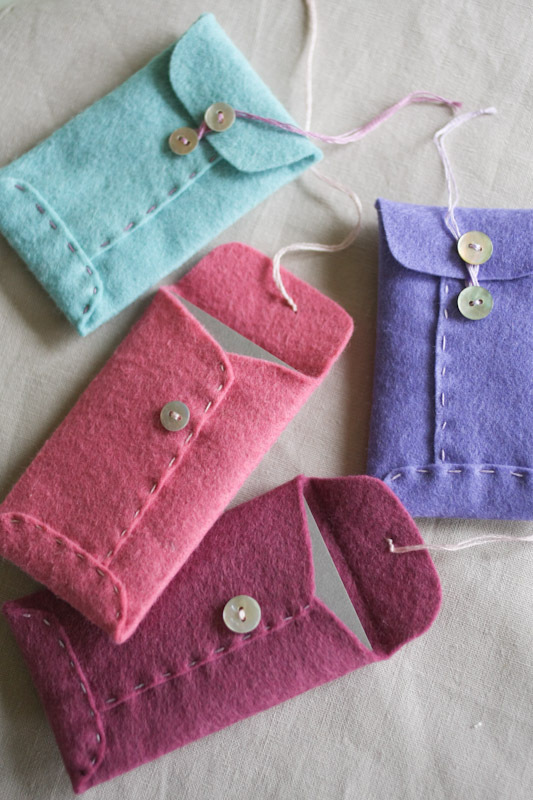 These are darling, thank you for sharing this idea! So darling! I love these and will have to try them out, especially since I have that template from PS! So cute! Just linked to you today! Gail, these couldn’t be cuter!! LOVE! These are beautiful! 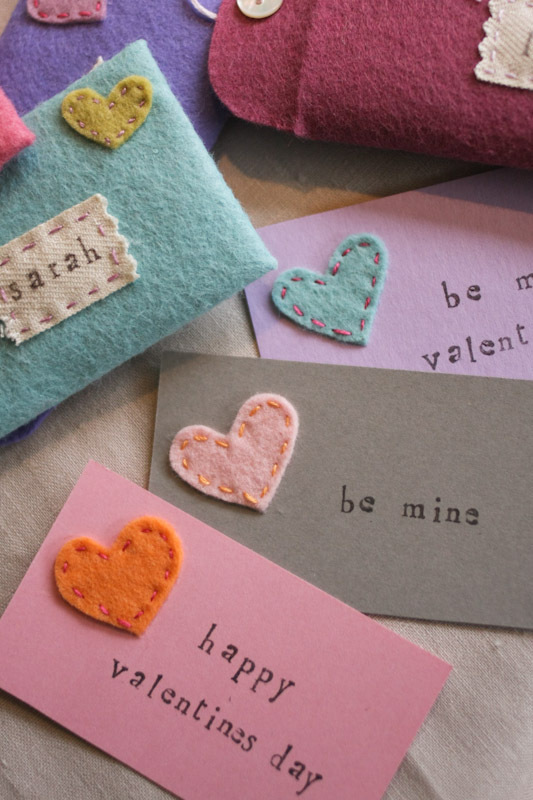 I’m trying to re-create them for this year’s Valentines and had a quick question about the labels: did you use fusible bond of some kind on the back of the twill tape, or did you use fray check on the edges, or did you just pink the edges and sew (no fray check, no backing)? thank you! i just pinked the labels and sewed them on with no backing – i figured they wouldn’t get handled too much so the pinked ends should hold up pretty well. a little fray check on the edges wouldn’t hurt though! These are so cute! I wanna make some! Where did you get the template to cut it out with or do you know where I can get others? Thank you! The template came from Paper Source – it’s their baby envelope template (http://www.paper-source.com/cgi-bin/paper/item/Envelope-Template-Kit/2506_006/40713000.html) but you could also unglue a small envelope and trace around it to create your own template. Good luck! What kind of stamp/ink did you use? I LOVE these! These are so cute! I just made them for Easter and put a gift card inside! I substituted the heart and did an Easter egg.